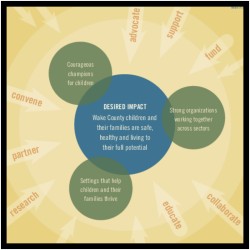 The John Rex Endowment has created a Strategic Roadmap to reflect what we have learned and how we will meet the current challenges facing Wake County children and their families. The board and staff of the Endowment have worked closely with our grantees, other partners and community representatives to set the general direction for future work. Our desired impact is to ensure children and their families are safe, healthy and living to their full potential. We will focus particularly on those children who are most vulnerable. Community settings where children and their families thrive. Commit to and deepen our understanding of health equity. This Strategic Roadmap is a broader vision for our efforts that builds upon what we have accomplished over time and what we are still learning. Guided by this Roadmap, in addition to grantmaking, we will also use approaches such as convening, collaborating and advocating to reach our impact. Our first funding opportunity under the new Strategic Roadmap will be announced January 9, 2019. In the Request for Proposals (RFP), we will define the eligibility and opportunity which will align with theme\s identified by the Wake County social determinants of health assessment that the Endowment released earlier this year. We will announce funding for our second cycle in May 2019. Available funding will continue our capacity building support for nonprofits. We will share more information about future grant opportunities throughout the year and continue to publish them through our newsletter, website and Facebook page. While we continue to evolve on this path, we will not deviate from our end goal of building a better future for children and their families. We welcome your input and thank you for being on this journey with us. To discuss our vision of the Strategic Roadmap you are invited to email Kellan or call her, 919-838-1110 extension 3. You may also find answers to your questions in our FAQ. We know that improving children’s lives is complex, takes time and cannot be done alone. The John Rex Endowment is hopeful and energized for what we can accomplish working together. We look forward to walking side by side with those who share our commitment to the well-being of children and their families.